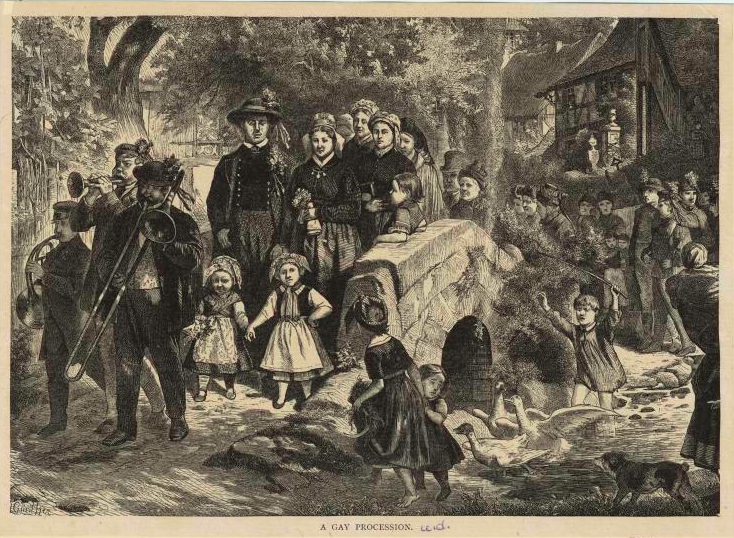 I just added another image to the 19th century timeline (2nd half), another depiction of a wedding celebration that includes trombone (c. 1885, shown below). 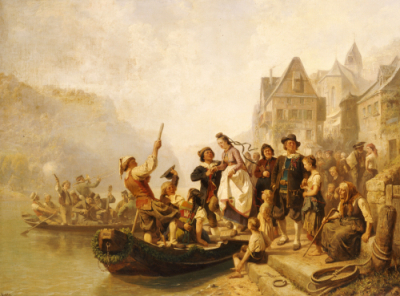 Wedding celebrations constitute a fairly common theme in trombone history, with a total of 14 related images spread throughout the Trombone History Timeline. They’re shown together below. The bulk of them are from 16th-century festival books, but there is still a fair amount of variety in evidence, amounting to an intriguing set of images spanning nearly the complete history of the trombone. c. 1520—Spain: The Engagement of St. Ursula and Prince Etherius, sometimes also titled St. Ursula and Prince Etherius Making a Solemn Vow, a panel painting from the Master of Saint Auta Altarpiece, depicts a trombonist with a wind band performing from a loft or window. 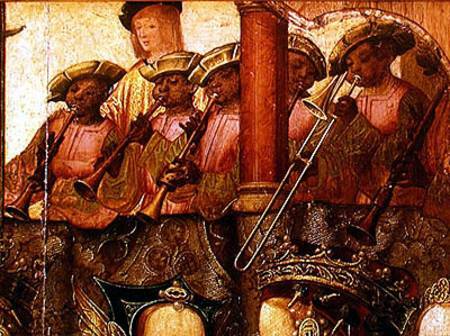 The painting may represent the earliest visual depiction of a black trombonist (see below detail and full image; public domain) (Lisbon, Museu Nacional de Arte Antiga, Inv. No. 597) (Bowles, Musikleben 30-31). 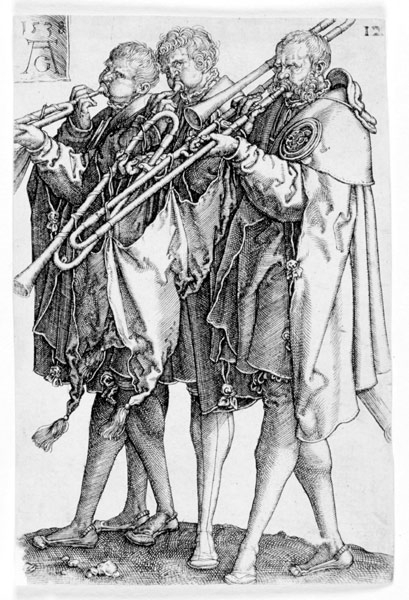 1538—Germany: Heinrich Aldegrever portrays a trio of trombone and 2 trumpets in a woodcut titled The Brass Players (Die Posaunisten) from the series The Great Wedding Dances (see below image; public domain) (Duffin, Trompette des Menestrels). 1549—Munich, Germany: Outdoor Feast, a painting by Hans Mielich (Müelich), court painter for Duke Albrecht V, depicts an outdoor wedding banquet. The music ensemble includes 2 trombone players, one of whom appears to have multiple instruments in his hands and is apparently in the act of switching from one trombone to another. 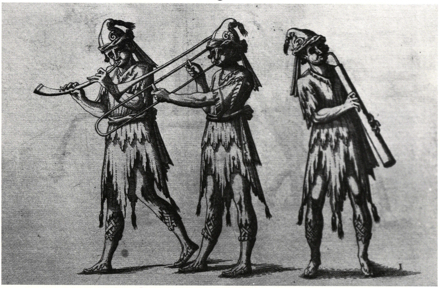 The painting also shows, in a different area, a dance band consisting of 2 trombones and another instrument (probably a shawm) (see below image; public domain) (Kenton plate 14; Buchner plate 95). 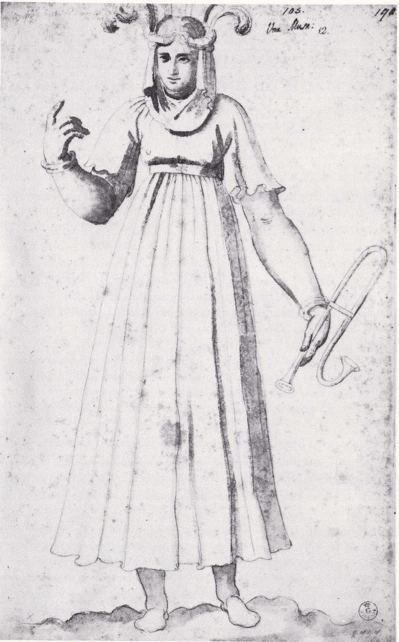 1566—Giorgio Vasari’s image of a muse holding an instrument features what Edmund Bowles labels an alto trombone. If it is indeed a trombone, it is a somewhat awkwardly-rendered depiction. 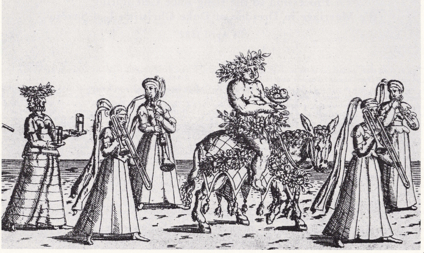 The image is associated with a performance of The Genealogy of the Gods for the wedding festivities of Prince Francesco de’ Medici and Johanna of Austria (see below image from festival book; public domain) (Bowles, Musical Ensembles 55). 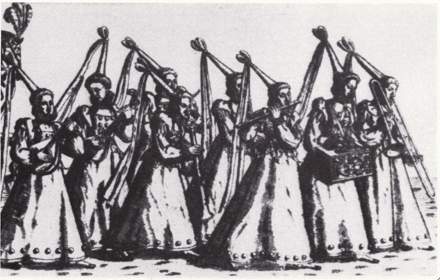 1580—Innsbruck, Austria: A procession to a tournament that is part of marriage celebrations of Johann Lipsteinsky von Kolowrat and Katharina von Boymont und Pairsberg includes a trio of dulzian and 2 trombones (see below image from festival book; public domain) (Bowles, Musical Ensembles 85, 89). 1582—Dresden, Germany: In a procession celebrating the marriage of Christian I of Saxony, a symbolic entourage of Bacchus includes a quartet of 2 trombones, cornett, and tenor shawm (see below image from festival book; public domain) (Bowles 103-4). 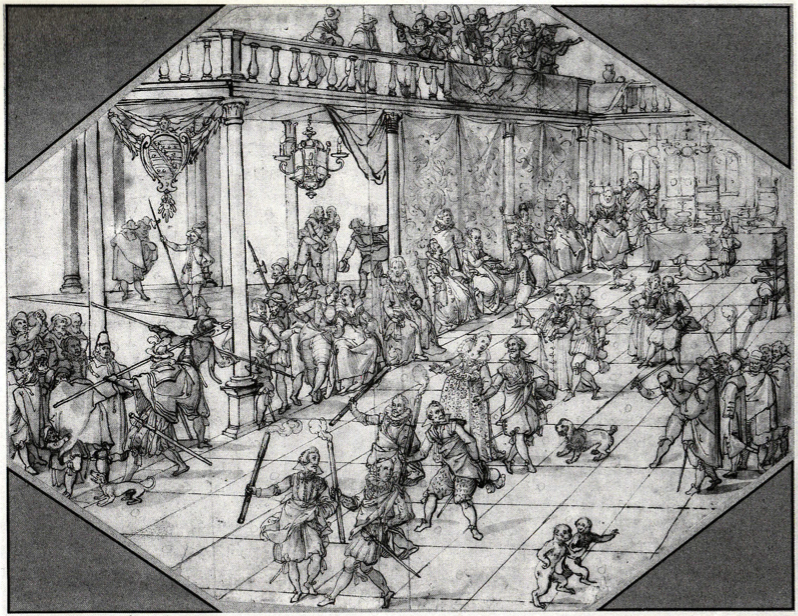 1584—Dresden, Germany: A procession during wedding festivities for Balthasar Wurm and Anton von Sahlhausen at the court of Saxony, includes 8 musicians dressed as women, playing trombone, lute, cittern, treble viol, bass recorder, tenor viol, transverse flute, and clavichord; a graphic representation of the procession shows the trombone at the head of the group (see below image from festival book; public domain). Another ensemble in the procession consists of bass recorder, cornetts, bombard, and trombones (Bowles, Musical Ensembles 105, 107). 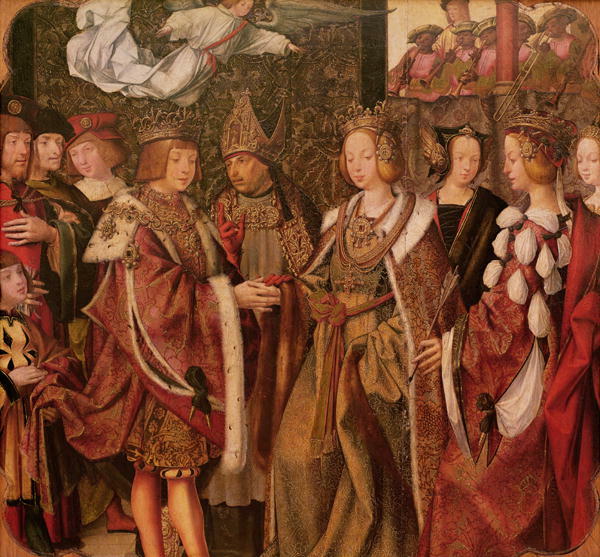 c. 1600—Fackeltanz bei Fürstenhochzeit, an anonymous image, possibly from Germany, depicts a torch dance at a prince’s wedding. 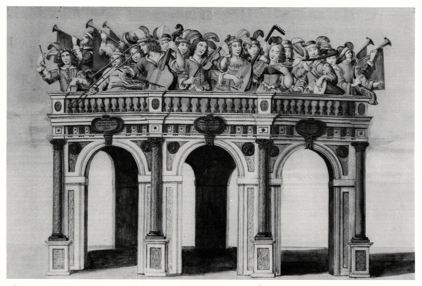 Instrumentalists supplying the dance music from a balcony include a tombonist (see below image; public domain) (Salmen, Tanz im 17 153). 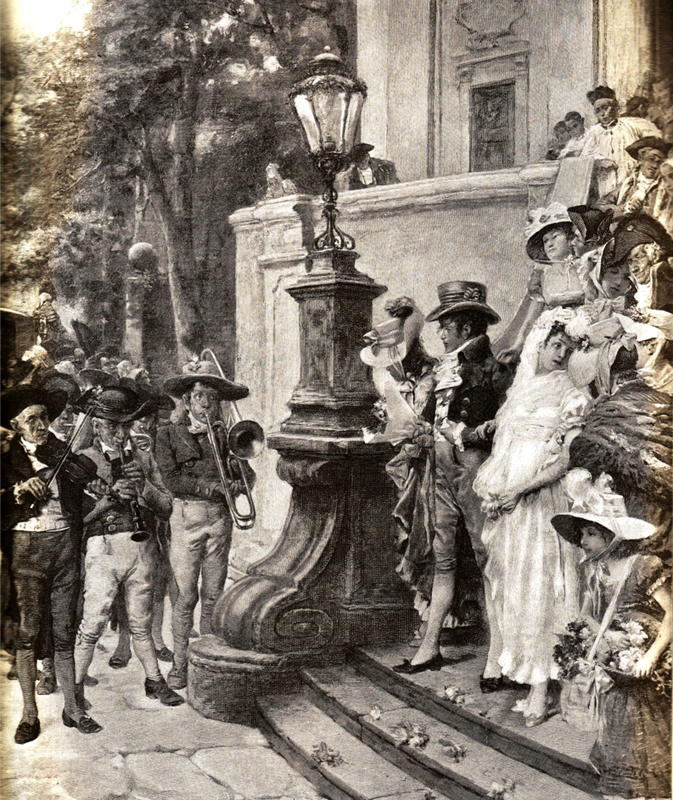 1609—Stuttgart, Germany: At the wedding celebrations of Archduke Johann Friedrich of Württemberg-Teck and Markgräfin Barbara Sophia of Brandenburg, a trio of trombone, cornetto, and bombard is featured in the Entourage of Young Court Noblemen (see below image from festival book; public domain) (Bowles, Musical Ensembles 177). 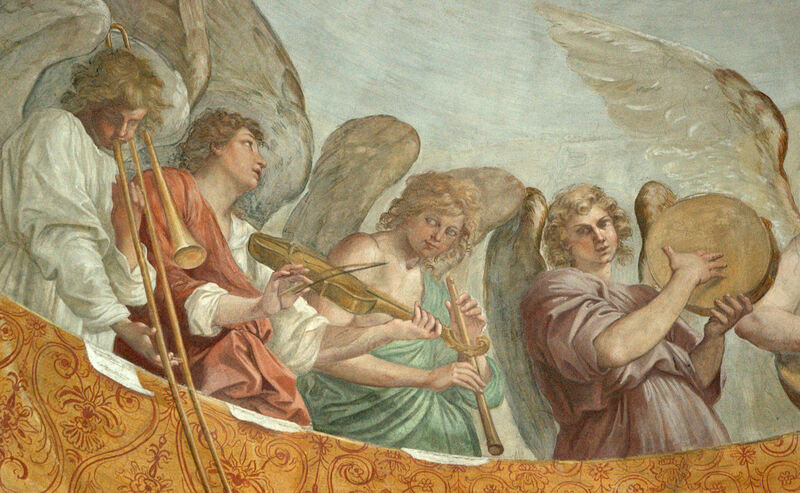 In a separate performance, “As soon as the noble party had arrived at the [court] chapel, there could be heard the trombones, trumpets and kettledrums [along] with two choruses placed opposite each other” (Bowles, Timpani 370). 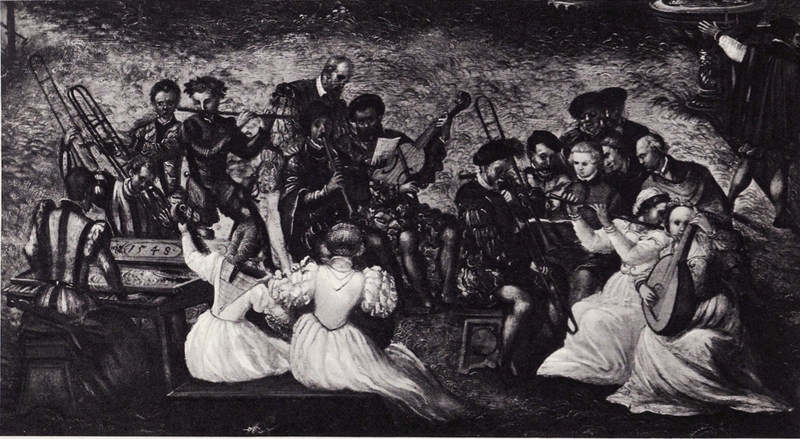 Also in connection with the celebrations, according to records of the time, “There was a completely glorious musical performance, with 20 voices and five ensembles with all kinds of instruments, such as lutes, fiddles, bassoons, dulzians, cornetts, trombones and others” (Bowles, Musical Ensembles 167). 1650—Turin, Italy: Marriage festivities for Princess Adelaide of Savoy and Prince Ferdinand Maria of Bavaria include trombones. First, on the way to the Cathedral of San Giovanni for the service itself, “Swiss Guards and arquebusiers of Their Majesties…lent their presence to the retinue setting out for the cathedral from the great hall of the palace [along] with trumpets, trombones, oboes and drums.” After the wedding service there are “signals by trumpets and trombones to those present who, because of the huge crowd, couldn’t observe the nuptials.” Later, during a series of races in the palace courtyard, races alternate with musical performances by musicians in a gallery (see below image from festival book; public domain): “From the other palace, above the gallery, among the various events alternating with the races was the reverberation of the sound of an ensemble of instruments; that is, trumpets which, animated by the virtue of such glorious love [of the newlyweds] became the voices of Fame; trombones, which, with harmonious notes echoed the praises of everyone, rousing more ardently by the hour the affections…” (Bowles 275-279). 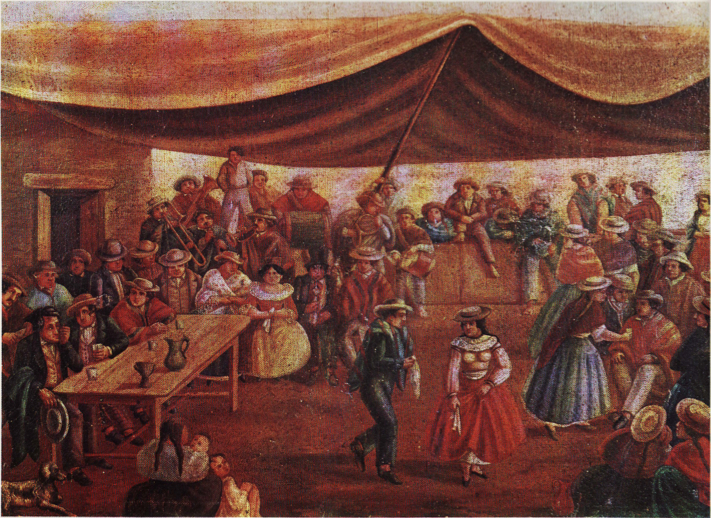 c. 1855—Artist Albert Kindler includes a trombonist in his painting After the Wedding. 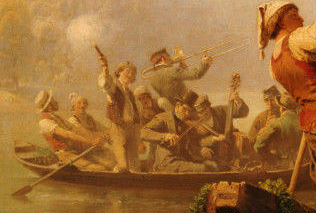 The trombonist stands in the musicians’ boat in the background (see below detail and full image below; public domain). 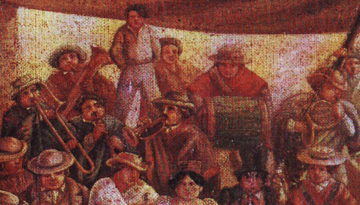 c. 1860—Peru: Artist Pancho Fierro depicts a trombonist performing with a wind band for a Peruvian wedding celebration in Fiesta de Matrimonio (see below detail and full image below; public domain) (Lavalle 38). c. 1885—Norway: A wood engraving titled A Gay Procession, signed by Günther, depicts what is probably a wedding procession in the Norwegian countryside. A trombonist leads the way, accompanied by trumpet and horn (see below image; public domain) (source: New York Public Library Digital Gallery). c. 1890—Italy: Antonio Lonza’s painting, Newly Married Couple, includes a trombonist as part of an ensemble performing outdoors for a wedding celebration. The trombone appears to have a double slide (see below image, after Lonza painting; public domain) (Seidl, vol. 2, 325).